Date tables in themselves are nothing new. Every data warehouse and business intelligence project includes one of those and typically it is one of the first tables which we find on our list of implementation tasks. Surprisingly, however, I am finding that in many implementations the omnipresent date table cannot support some analytics. In this post I will outline a few considerations which we need to take into account when building date tables in general, and some which apply specifically to SSAS. UPDATE (9th October 2011): If you are a PowerPivot user (or would not mind using an OData feed) there is a simple way to get a date/calendar table as there is a free one available on the Azure DataMarket. I recently blogged about this new project in my Introducing Project DateStream (CodePlex) post. UPDATE 2 (16 October 2011): John Simon recently published a nice T-SQL script which can be used to create and populate a date table on his blog. Have a look if you need one! In general, date tables are on a daily/date grain. This is because the lowest level of reporting we need to do is very often on full days. Even if we need to analyse on time intervals smaller than a day, we should still build a Date and a Time table to support this. Why? Because if we pack it all in the same table we end up with too many rows and this is something we typically want to avoid in any dimension. As we have a row per day, one of our columns is inevitably based on the calendar date. It is also typically the dimension key. As with all other dimension tables, we need to be able to join the table to our fact tables and this is done on our key. To keep our fact tables as small as possible, we need the smallest possible data type for our keys, and in the case of a Date this is usually an integer. However, unlike with other dimensions, we do not have to have a meaningless integer for our surrogate key because it does not give us any advantage. 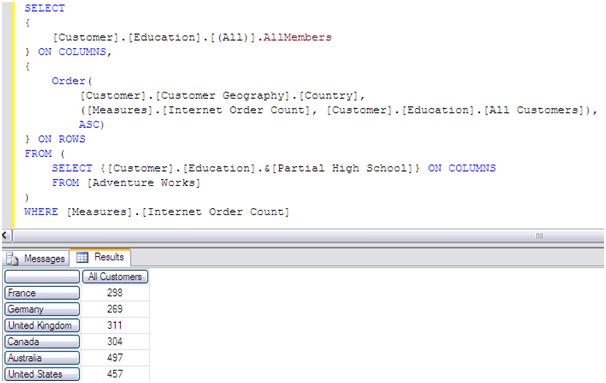 It is very easy to convert between a datetime and an int and in SQL Server datetime is 8 bytes, while int is 4. 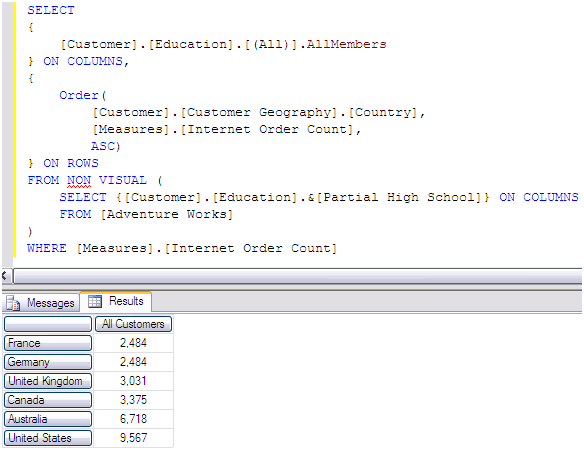 In SQL 2008+ we have another type suitable for our date table key – date, which is 3 bytes. However, for compatibility reasons, it is frequently better to stick to an int. Luckily, we also have the very convenient ANSI/ISO 8601 standard to follow in order to make our integer dates easier to work with. If we do encode them with the YYYYMMDD format, (thus the 15th of January 2011 becomes 20110115), we can easily sort on the column and compare two dates with the standard > and < operators. Additionally, we also escape the ambiguities around date formats in the USA and the rest of the world. Building the date key column is a good start but to allow for better analytical capabilities we need to add other attributes. As in most cases we need to analyse our data not only on days, but also on larger intervals (e.g. Months, Quarters and Years), we need to add columns for each of them. A typical requirement is to support both Financial and Calendar date hierarchies. As with dimensions it is ok to have many columns, we can add one for each combination of the type of calendar and period (e.g. FinancialMonth and CalendarMonth, FinancialQuarter and CalendarQuarter, etc.). Other interesting attributes we may want to have materialised in the table are the likes of Weekends, Public Holidays (even though we need to maintain these), Solstice/Equinox and PhaseOfMoon (thanks for Thomas Kejser for mentioning these in an online conversation recently). Basically, for a fully functional date table we need to consider anything which could be of business value without going to extremes. Of course, when working with SSAS we also want to have an integer key for each attribute and possibly a common name for it. This multiplies the number of columns we need by two – one Id and one Name column for each of the attributes we have decided to implement. Some attention needs to be spared when determining the formats of each attribute Id. If we are to be building a hierarchy out of a collection of attributes we want those to form a nice natural hierarchy. That is – each child member should not have two parents with different Ids. To illustrate the concept, let’s consider two different months – January 2011 and January 2012. While they are the first month of the calendar year, they represent different entities when reporting. We do not aggregate data to January only, but to January in each respective year. 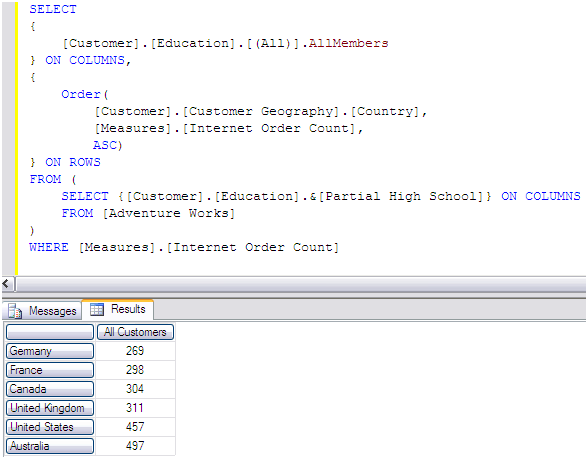 Therefore, if we were to write a SQL query to get data for January 2011 and our Ids for both of these members are 1, we would also need to use the Year attribute to get the values we need. Effectively, our hierarchy would have two children with identical Ids of 1 with different parents (with Ids of 2011 and 2012). This is a particular problem when working with SSAS as it definitely prefers unique Ids for each separate attribute member. There is a very easy solution – we can include both the Year and the Month number in the MonthId. In our case, January 2011 gets an Id of 201101 and January 2012 – 201201. Now we don’t have the same issue. Similarly, we must pay attention when we construct the Ids of other attributes which participate in our hierarchies like Quarter (YYYYQQ) and Half Year (YYYYHH). The week is a special case in the calendar. While we can say that Days roll up to Months, which roll up to Quarters, which in turn roll up to Half Years and Years, Weeks are a different story. If we are not using a special calendar like a 4-4-5 calendar, we are dealing with a real-world entity, which does not naturally belong to only one larger period. In most cases we do not have to worry about the week falling between Day and Month as business understands that this is not a very easy to work with hierarchy. However, business users very often are ignorant about the fact that weeks do not roll up nicely to years, too. We can again read ISO 8601, which also deals with the Week->Year problem. Basically, the ISO has come up with a simple solution – if we have a week which has dates in two years, we count it towards the year which contains more dates (or, the year which contains the Thursday of the week). Why is this important? Well, we can simply split a week in two, however, this means that certain weeks in our table contain less than 7 days. If we compare such weeks with a Weekly Growth calculation we will notice a problem – the amounts aggregated to them are smaller than usual. Similarly, on a graph showing weekly amounts, we have a dip as the two parts of the same week are plotted as separate points. If the users do not care, then it is not a problem, but it is something we should consider and ask about when building the week attribute in our date table. The date table has a limited amount of rows and we have to make a decision on how many are enough. Some developers build date tables with ranges all the way from 1900 to 2100, or even further. As we have roughly 365.25 days per year (note how 1900 is not a leap year, not is 2100 – something Excel doesn’t know), for 10 years of data we end up with ~3652 rows. With 100 years we have 36525 rows. It is quite doubtful that a data warehouse will contain data for all these years. In most cases it contains a bit of historical data and is designed to keep data for another 20-50 years. To optimise the performance of the queries using the date table it is a good idea to have a dynamic range of dates. In our ETL we can easily keep expanding the range as needed, or collapse it if we ever purge fact data. One thing which is often overlooked when picking the date range is the fact that many times queries depend on the completeness of the date range. A major mistake, which we must avoid are basing the date table on fact data and allowing gaps in the range, and having incomplete top-level periods. The first problem is easy to explain. Zealously trying to keep the date dimension as small as possible by reducing the number of days (i.e. rows) to only the applicable ones for our fact data can introduce gaps in the overall table. In example, if we have no data for 26th of January because our business was closed for Australia Day, and we “optimise” the date table to exclude this day from the date table, all analytics which depend on counting the number of dates in January will be skewed. An average calculation doing Sales/NumberOfDaysPerMonth will divide by 30, not 31. One of the reasons for having a date table at the first place is to avoid such problems. Hence, gaps in the date table must be avoided. Secondly, we must also ensure that all top-level periods (i.e. Year usually is the top level in the Calendar Hierarchy) must be also complete. It is not acceptable to cut off the date range with a month, so we have a constant number of dates. Even if our fact data is implemented over a fixed window of 24 months (rolling), we should not do the same with the date table. In example, if we are in September 2011 and we have fact data for 24 months prior to this (e.g. September 2009 – September 2011), the date table should also include data for months prior to that (e.g. January 2009 – September 2011). The reason is the same as before – all calculations doing Amount/NumberOfPeriodsWithinAPeriod would be wrong for 2009. Furthermore, if we use something like window functions in SQL partitioning by year and counting the months within the period to compare equivalent ones will be incorrect. The first month of 2009 would be September and the first in 2010 – January. Because of such issues, it is best to keep all top level periods complete. A solution could be removing data from the date table once we are not interested in the complete top level period. In the case of the 24 rolling months, we can remove all of 2009 with all its periods/rows once we move to 2012 and we are interested in January 2010 – January 2012. 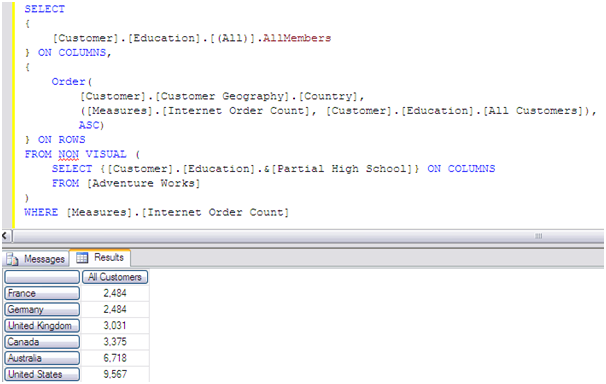 In SSAS all date functions like ParallelPeriod and ClosingPeriod work with relative periods. To get the ParallelPeriod for January 2010 in 2009, SSAS will determine that January 2010 is the first month in 2010, go back to 2009 and pick the first month there. If the first month is September 2009, we will get that returned. As with other dimensions, we should also have an Unknown member in the date dimension. While with all other dimensions we usually pick a value like -1 for the Unknown member Id and Name of “Unknown”, with a date table things a slightly different as we often have columns which are some sort of a date/time data type and we cannot cast -1 to a date in a meaningful way. Therefore, in many cases we can pick a complete outlier, like 19000101, which we use for storing Unknowns. Depending on the scenario, we may not need to do that, but if we do, there is nothing wrong with doing that as long as we make sure that it is clear that it is a special case. If the data starts in 2001 and we pick 20000101 as an unknown value many users will be wondering why there is some data against that date. The best date table is the one we don’t notice and take for granted. Given that it is not something that changes at all, the structure of the date table is the one common over many different implementations and whether in SQL Server, SSAS or PowerPivot, the fundamentals stay the same. It can be shared and is part of the base of virtually every BI solution. It, unfortunately, is built wrong very often, thus severely impairing the capability of the system it is a part of. With the arrival of self-service BI I could imagine an increasing need for practical advice on this specific data modelling technique and I hope this article helps with delivering a bit of it. Just recently I was optimising the processing time for a rather large cube on my laptop. The hardware I used was not tremendously powerful (a mobile i5 CPU, 8Gb RAM and one 7200 RPM hard disk) and having a 500M rows fact table proved to be somewhat of a challenge for it. The set up was fairly typical – a large fact table, with a few dimensions in a typical star schema. The goal was to get it to process as fast as possible. After ensuring all best-practice advice from Microsoft (and in particular SQL CAT) was followed, I managed to get the processing down from 7381.075 seconds to 5801.536 s (approximately 21% improvement). However, one thing still did not look quite right – the CPU utilisation during the partition processing phase. Considering my hardware configuration it was easy to deduce that the HDD would be more of a bottleneck than the CPU. There was only one HDD and everything, including the source database and the SSAS files, was on it. During the partition processing reading and writing is happening simultaneously, which is not good for performance. At the same time in my case the CPU utilisation was on around 75% with 25% to spare, which was not great. Ideally, I would like to see my CPU on 100%, or very close to that to ensure that I am utilising all of its power. However, I had no way to add more disks. Luckily, in SQL Server 2008 (Enterprise Edition) we have the option to compress database tables, or partitions. We do get a performance hit on the CPU when we (de)compress the data, but it takes less space on the disk and thus requires less IOPS to read it. It sounded like a perfect fit for my problem. After estimating the benefits in terms of size row and page compression gave me, I decided to go with the heavier option since even its marginally better (5%) reduction of size over row-level compression was desirable. After waiting patiently for the compression operation to finish, the overall database size did drop to around 30% as predicted. I run my SSAS processing script again and it completed in 4805.408 seconds – approximately 17% better than the previous run, which is a very significant improvement. The CPU utilisation went up to around 97%, which also meant that my blunder with the page vs. row compression produced, generally, good results. One thing we must always consider is whether the bottleneck is in the IO. A few months later I replaced my hard disk with a new SSD (OSZ Vertex 2), which increased the IO performance of my laptop dramatically. When I tested SSAS processing tasks I could almost always see my CPU steady at 100% without any compression. If I were to compress my fact tables I would expect to get worse performance because my CPU would struggle to both decompress and process the data at the same time. In conclusion, you must know what your bottleneck is before you opt for a solution like compression. It comes at a price, but the price may well be worth paying if your system is not well balanced. There are a few techniques which can contribute to this topic and I will list some tips which seem to elude many people experiencing problems with their implementations. Yes, it is convenient to just drag-drop some hierarchies and measures in the Cube Browser, or in Excel, but when you have troubles with your results these tools will obscure the results. This is happening because every client tool has to generate MDX and by doing so they often generalise the approach and add “nice” language constructs like VisualTotals, or always use a subselect clause. There is nothing wrong with checking the end-result of your work with tools showing what your users see, but when your calcs don’t behave the way you expect (especially when filtering things), I would definitely stay away from GUI clients. Instead you can write some MDX in SSMS and pull exactly what you need in a clean and straight-forward way. We can play with swapping WHERE clauses for subselects, add calculations directly in the queries, etc – in brief, we get the full calculation power of MDX in our hands for troubleshooting. Additionally, next time you ask a question someone else you can start with “I have this MDX query…” instead of: “I have this pivot grid in Product X…” – it is much more likely that you will get a meaningful response. If your MDX works perfectly fine against your cube, but when you use Excel 20xx you get funny results, there is no better way to find what the problem is than to run a trace with SQL Server Profiler, capture the MDX the tool has generated and then work with that to debug – again in SSMS. Different versions of Excel generate different MDX and the difference can be very important. When using other tools the differences become even larger. The only way to see what your tools does (other than talk to the people who have built it) is to capture its SSAS queries. Once you have arrived at the conclusion that you need help (e.g. after exhaustively searching for the problem online), you can quickly get an answer at a few forums. My preferred one is MDSN, which has a dedicated SSAS section. Also, you can ask at the www.ssas-info.com forum section, or even at StackOverflow. Either way, you will need to know what the versions of each product you are using are (especially SQL Server version, service packs and updates applied) and ideally – post your MDX (if you have 10 pages of queries it would help to somehow abbreviate the repeating sections instead of copy-pasting the lot). Do not also forget that the people who are reading your questions do not know your dimensional model and what features of SSAS you are using (e.g. LastNonEmpty, unary operators, etc.) – make sure that you describe any specifics – otherwise everyone would assume a typical star with a straight-forward implementation in SSAS. These approaches, together with being courteous and good with spelling and grammar, will help attract fellow developers, who may know a little SSAS quirk, or MDX feature which resolves your issue. Replicating you problems in Adventure Works is another great way to ensure you get an accurate answer. Because typically everyone on the forums has access to Adventure Works, showing some MDX which results in an unexpected for you outcomes is the best way to pinpoint the problem eliminating all question marks which your specific model and data could be introducing. Additionally, you will probably get an answer which includes some sample code and you will be able to run it immediately and see the results.